The largest city of Campania, capital of the province and the region, Naples is the third most populated city in Italy (after Rome and Milan), with over a million inhabitants, and is the most important industrial center and trading port for the South. It is situated halfway down the Tyrrenia coast, at the innermost point of the Bay of Naples, between Vesuvius and the Phlegrean Fields. It has a mild and constant climate, with average temperatures of 16° C and a serene sky for at least half the year. Among the major industries are metalworking, oil refineries, mechanics (naval and railroad), electricity and food producing. The artistic crafting of coral and tortoise shell flourishes. A point of embarkation for emigrants in the past, Naples now has a large traffic of merchandise (petroleum, carbon, cereals) and passengers. It is the largest Italian port, with a noteworthy nexus of railway and highways and a large international airport. In the vast urban area one can distinguish many different neighborhoods: the old center, characterized by buildings closely crowded together, is bordered on the west by the new administrative district and on the east by the business district, into which flows almost all the road and rail traffic. Other neighborhoods, with narrow climbing streets, rise around the base of the San Martino and Capodimonte hills. 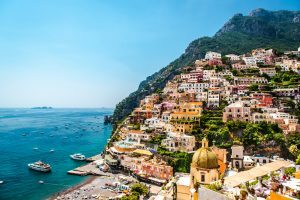 These neighborhoods have experienced intense development, typically of the simpler kind, in contrast to that of the residential neighborhoods that stretch out comfortably along the Vomero and Posillipo hills. The original nucleus of the city can be found on the little island of Megaride. Occupied today by Egg Castle (Castel dell’ Ovo), it was first a settlement of the Aegean Greeks, then the Rodi, followed by the Cumani, in the seventh and sixth centuries B.C. The Cumani also occupied the Pizzofalcone heights and named the city Palaepolis (Old City). Around the fifth century B.C., Neapolis (New City) arose in the surrounding areas, exercising strong cultural influence based on its Greek roots. In the following century it was occupied by the Romans, surrounded by walls and characterized by blocks of streets formed in grids. Later it was occupied by the Byzantines, then the Goths, and then became capital of an autonomous dukedom. After a brief period of Longobard dominion, it fell under Norman control, until Ruggero II of Altavilla, King of Sicily, was able to add it to his kingdom in 1139. With the Angevin conquest in 1266, Naples became the capital and experienced notable demographic and urban growth. New growth occurred with the arrival of Alfonso of Aragon and with the reign of his successors (fifteenth century). The capital of the South, an enchanting destination for a short stay between art and culture in the Mediterranean climate and unmistakable that radiates this city of a thousand faces. The city is unique already from the natural configuration: Naples opens in the shape of an amphitheater on the sea and is bounded by the Vesuvius, the Sorrento and Amalfi coast and the marvelous islands of Capri, Ischia, Procida and Capo Miseno. The origins of this city are lost in the times and in the fascinating legends, the hypothesis currently judged more reliable is the one that placed its birth in the ninth century BC, when the Greeks colonized the gulf “to head towards the mining emporias of the upper Tyrrhenian”, founding Partenope. Later the city was abandoned, taking the name of Palepolis (old city); only in 470 AD the Cumans founded Neapolis (new city) in the eastern part of the original city according to a plant called “per strigas”, that is organized on a network of streets placed in an orthogonal way, still visible in the modern city (Naples is the only one Western “poleis” to become a metropolis). Although the hot periods are the most popular for visits to the capital of Campania, the Neapolitan winter is far from off. Be sure to check out arsenal news. A weekend in Naples can have a positive effect on mood and is extremely recommended, therefore even in the cold season. The train is probably the most convenient way to reach Naples, the most important station is the Central Station, in Piazza Garibaldi, well connected to the rest of the city by the underground railway, the Circumvesuviana and buses; if you want to reach the islands, Ischia, Capri or Procida and the Sorrento coast, it is good to arrive at the Mergellina station, considering that the hydrofoils leave near the latter. As for the plane, very large planes do not land in Naples that normally operate on intercontinental routes; this date the proximity of the Capodichino airport to the city. So you can start a short and dynamic tour of the city, certainly not exhaustive, given that a thorough visit would take a long time, but still instructive and exciting, through what has been called a real “open air museum”; ideal starting point is Piazza del Plebiscito which offers an incredible glance, in fact from some points of the square it is possible to have a fascinating view of the Gulf of Naples and of the Vesuvius. The square is home to architectural beauties such as the Basilica of S. Francesco di Paola , commissioned by Ferdinand I of Bourbon and built between 1817 and 1846 by architect Pietro Bianchi, who conceived it, in the wake of the dictates of the neoclassicism prevailing at the time, in the likeness of the Pantheon of Rome; facing the Basilica there is the Royal Palace, designed by Domenico Fontana and dating back to the beginning of the sixteenth century, characterized by a series of arched openings transformed by Umberto I of Savoy into niches to house the statues of the leaders of the Neapolitan dynasties. Inside the Palace are currently preserved innumerable pictorial evidence, including a portrait of Titian, and minor arts such as tapestries and porcelain. After admiring the eternal treasures of this square you can cross Piazza Trento and Trieste to reach Via San Carlo , where we find one of the most famous theaters in the world, the Teatro San Carlo ; it was originally designed by the architect Giovanni Antonio Medrano, by the will of Charles III of Bourbon, and inaugurated in 1737. Following a disastrous fire that razed it in 1816, it was rebuilt within a year by the architect Antonio Niccolini, which had already renovated its façade; just in front of the Theater stands one of the four façades of the Galleria Nazionale Umberto I , completed in 1892, whose pre-eminent destination has always been commercial, considering that it houses in its interior shops, boutiques and more “fashionable” cafes, as well as the first cinema hall of the city; to note the beautiful glass “dome”. At this point it is necessary to follow the panoramic via Partenope from which you can see a disturbing view of the Posillipo hill and of the Villa Comunale which houses the important Zoological Station. During the Christmas period you can not go along via San Gregorio Armeno that comes alive thanks to the artisan shops sparkling with festive ornaments; at this point you can visit the church of San Gregorio Armeno, dating back to the VIII century. After this exhausting tour to the magnificent beauties of Naples you need to relax a bit, perhaps at the “Gran Caffè Gambrinus”, one of the historic bars of Italy, where so much art, literature and history have seen the light and where you can sip drink amiably prepared with absolute professionalism; if you prefer “wine and snacks” Naples once again has what it does for you, since recently a series of very characteristic wineries have flourished in the historic center, such as “Bacco” or the “Wine bar Passing”, known for the environment sought after among “cool” music and literary performances to watch also at “Vibes cafè”, or the famous “Vineria del centro”, always very popular hotels and Manchester Travel Guide. To seal the roundup of traditions so far followed, the Neapolitan pizza should be tasted, and where to do it better if not to the “Pizzeria Di Matteo”, where even Bill Clinton succumbed to the temptation? Other recommended and of undoubted fame are “Trianon a Forcella” and “Brandi”, while for typical restaurants, where you can taste fish, you can opt for “Mimì alla ferrovia”, “Da Bruno” or “Ciro a S.ta Brigida “. With a full belly and senses satisfied by the unique tastes and flavors of Neapolitan cuisine, one can abandon oneself to the warm night of Naples, perhaps choosing a lively disco bar, such as the “Art Café”, or a conventional disco, even if a little ‘ decentralized, like the “Michelammà”. If you prefer a particular place characterized by the atmofera of “South American fiesta” and live events, the “Havana” is for you, even a little out of the way. For the more “alternative” it is a must to visit the self-managed social center “Officina 99”, also famous because from here the 99 Posse took their first steps. Do you prefer a cultural evening? If you are lucky you can find places for the San Carlo, where the season was inaugurated with the “Perséphone” by Strawinskij, which sees the protagonists Isabella Rossellini and Gerard Depardieu. Classic and brilliant prose billboard for the Mercadante Theater, Bellini and Augusteo.